After smashing up South Africa and Italy, the superheroes of Hollywood blockbuster “The Avengers” finally landed here Sunday, causing traffic disruptions on a usually busy Seoul bridge. 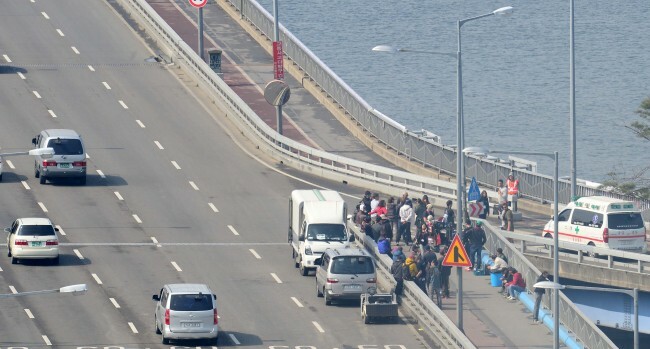 The shooting for “The Avengers: the Age of Ultron,” a highly-anticipated sequel to the 2012 mega-hit film, began at Mapo Bridge as part of its two-week stint in Korea, blocking all lanes on the bridge for nearly 12 hours from early in the morning. Much of the details are being kept under wraps, including the plot and who will appear in the scenes filmed here. The bridge scene was said to involve large-scale action and feature at least one of the heroes Captain America, played by Chris Evans. “Age of Ultron” reunites Earth’s mightiest heroes, including Iron Man (Robert Downey Jr.), Hulk (Mark Ruffalo), Thor (Chris Hemsworth), Hawkeye (Jeremy Renner), Nick Fury (Samuel L. Jackson), Black Widow (Scarlett Johansson), Captain America (Chris Evans) and S.H.I.E.L.D. agents Coulson (Clark Gregg) and Maria Hill (Cobie Smulders). Newcomers include Scarlet Witch (Elizabeth Olsen), Quicksilver (Aaron Taylor-Johnson), Vision (Paul Bettany) and Ultron (James Spader). Other than Evans and Korean actress Kim Soo-hyun, who plays “a substantial supporting role,” it is not known who from the cast will join the Seoul shoot. According to local reports, Seoul will be featured as a high-tech city, from where the enemies steal a powerful new technology that the heroes try to reclaim. The “Saebit Dungdungseom,” a city-owned, man-made island floating on the Han River and another location in Seoul where the film will be shot, will be used as the cutting-edge science lab where the technology is developed and where Soo-hyun works as a genius scientist, according to the reports. Sunday’s filming on Mapo Bridge forced buses to take alternative routes and nearby subway gates to close. Despite the traffic disruptions, there was no major congestion in the area. The crew will continue shooting through April 14 at a total of six locations, and is expected to cause a sizable amount of traffic disruption. Traffic will be shut down at the film locations for 11 to 13 hours a day: a 1.8-km stretch of road in Digital Media City from 6 a.m. to 6 p.m. on April 2-4; the Cheongdam Bridge from 4:30 a.m. to 5:30 p.m. on April 5; the 730 meters of Gangnam Boulevard from 4:30 a.m. to 12 p.m. on April 6 and a road near Kaywon University of Art and Design in Uiwang, Gyeonggi Province, from 6 a.m. to 6 p.m.
“The Avengers,” which opened in May 2012, earned over $1 billion worldwide and attracted nearly 7 million viewers in Korea alone. “The Age of Ultron” is scheduled to hit theaters in May 2015.